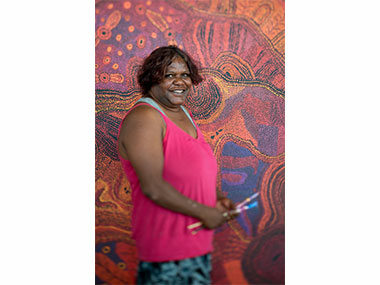 Visiting the Anangu Pitjantjatjara Yankunytjatjara (APY) Lands in the north west of South Australia in recent weeks, SA Art Gallery Director Nick Mitzevich kept asking himself how he’d feel if someone told him where he could or couldn’t live. Since the late eighteenth century Aboriginal people have been relocated and the outcomes of this have been largely devastating for Aboriginal culture. As I flew across the country, I asked myself repeatedly: what has changed; what have we learnt; are we just repeating history? Maybe art is the answer here? With a population of just over 2,500, the APY Lands punch well above their weight as a source of art production in this country. A constellation of art centres dotted along the Lands are at once the epicentre of community life, and the engine room for the production of Aboriginal art that is celebrated the world over. It’s hard to imagine that communities like those found in the APY Lands could be facing closure as in in other parts of the country. These communities are home for Aboriginal people who have suffered unimaginably, and for generations, at the hands of colonisation, Christianity, military experimentation and pastoralism. Community-based art centres offer a salve against generations of loss, diaspora and dysfunction. Art is the answer – a potent means of reclaiming culture and giving wider Australia a narrative, dare I say, an identity that sets us apart from the increasingly ubiquitous and globalised west. The art centre model is one that actually has its origin in South Australia with the establishment of Ernabella Arts in 1948 as a place for Pitjantjatjara and Yankunytjatjara women to earn an income from craft practices. Today Ernabella Arts is an Aboriginal-owned and run collective that has continued for almost 70 years to provide a place for Anangu to keep culture strong. Ernabella Arts is located in Pukatja Community at the eastern end of the Musgrave Ranges. Far from ‘remote’ in the traditional sense of being cut off from the outside world, this dynamic art centre has a history of engagement and experimentation with diverse practices, including the trading between cultures that occurred with white pastoralists from the 1930s on. In the 1970s Anangu artists from Ernabella travelled to Indonesia and subsequently introduced batik to the desert, while in recent years, residencies in Jingdezhen, an historic centre for ceramics production in China, has led a reinvention of ceramics at Ernabella Arts. Tjala Arts in Amata, isalso an Aboriginal-owned and managed corporation. Neither a charity nor a white-fella lead NGO, this art centre, and sister organisations across the Lands, is governed by Anangu. A recent project which began at Amata as a means of engaging young men in the traditional art of spear (kulata) making has now spread across the Lands bringing men across several generations together. This project, initiated by senior law-men and brothers, Willy Kaika and Hector Burton, assisted by artist and curator Jonathan Jones, had its first public outcome in the 2014 Adelaide Biennial of Australian Art where hundreds of kulata were suspended from the ceiling at the Art Gallery as a potent symbol of resistance against colonisation. The suspended spears were accompanied by a sound work that includes the voices of the older men singing and the distinctive sounds of the rolling of spears in preparation for battle, tirkilpa in Pitjantjatjara. TARNANTHI, the inaugural Festival of Contemporary Aboriginal and Torres Strait Islander art, will be presented by the Art Gallery of South Australia in October this year. This is the next iteration of the kulata project which has gained momentum, spreading across the Lands and attracting national attention in its potent translation of a traditional craft into a moving twenty-first century installation. This project epitomises the spirit of resilience and reinvention that characterises the APY Land art centres and their communities. While painting has dominated production in most of the art centres in recent times, the perceived ‘cooling off’ of the art market has led to other art practices such as punu (wood working), textiles, ceramics, tjanpi (spinifex weaving) and printmaking sharing space with painting. Some of these media, previously relegated to the realm of ‘busy work’, have been reinvented via contemporary art as strong communicators of Anangu culture and ongoing connection to country. 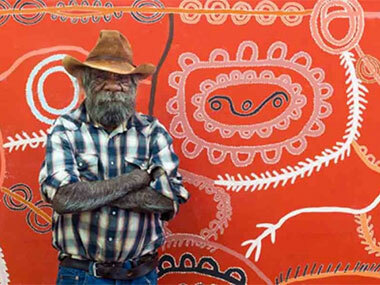 Anangu art will soon be on the world stage when the new Australian pavilion opens at the Venice Biennale this month. 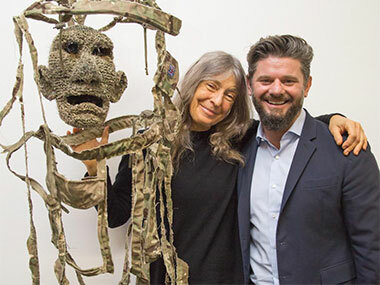 The collaboration between the Tjanpi Desert Weavers and South Australian artist Fiona Hall, made initially for the TarraWarra Biennial – Whisper in my Mask – will feature in Hall’s opus. Titled Kuka Irititja (translated from Pitjantjatjara as ‘animals from other times’), the work includes native animals that have been endangered by colonisation crafted from the desert grasses that have sustained Aboriginal people for millennia and found materials, including authentic military camouflage. This work celebrates Anangu concern for country and the sheer material inventiveness found in communities frequently and erroneously described as the world’s most remote. While for non-Aboriginal Australians these communities may be physically and culturally distant from their lived experience, for Anangu, country is closely protected, understood and deeply loved. White Australia has much to learn from this connection to country. Art is potent – it has a capacity not only for cultural maintenance, but also for regeneration and redefinition that has been proven throughout history. Art can be the answer if we allow ourselves to believe it. TARNANTHI, the inaugural Festival of Contemporary Aboriginal and Torres Strait Islander Art, opening at the Art Gallery of South Australia and across Adelaide from 8 October 2015. Nick Mitzevich originally penned these thoughts for Adelaide's InDaily Magazine. Reproduced with permission.